It's journal keeping for the 21st century. Instead of paper and pen, it is your journal on your Mac. 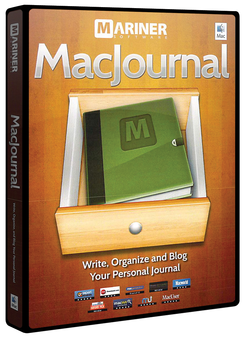 Unlike other journal applications, MacJournal is packed with features, setting it apart. You can create as many journals as you’d like: for work, home, family, or friends. You can upload your entries to your blog. Record a message or a child's first word. It is one place where you can put everything. With MacJournal you can document any life event with all the sounds, images - even video - that comes with it. You can’t do that with a notebook. Mariner Software created and designed MacJournal, the world's most popular journaling application for the Mac, so that you can start writing and express yourself the moment you launch it. Easily create a journal - for your dreams, your family or a special time of life - anything. Then, take the plunge and write your entry. It can be your first thoughts of the day, a summary of a good book or just to unload from the week. With MacJournal, the only limitation is the one you set for yourself.